Happy Beds have teamed up with German company Room in a Box to offer the UK's first cardboard bed. Yes, really! 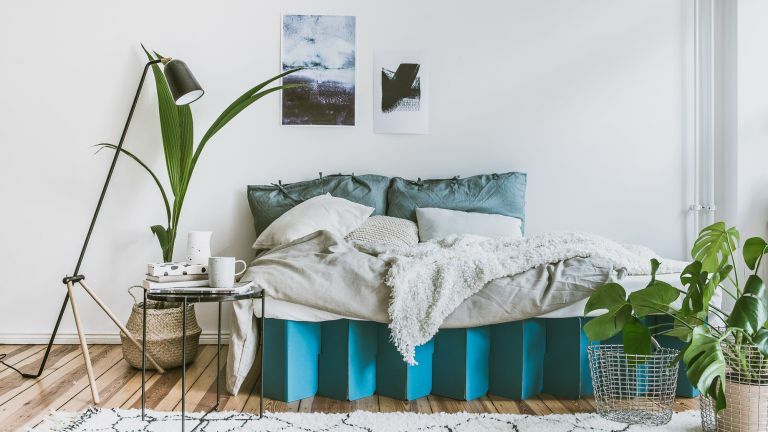 Not only is this flat-pack bed made from 70% recycled cardboard and vegan-friendly glue, it takes less than 30 seconds to put together and requires no tools – or DIY skills, for that matter. The innovative bed is being lauded as the perfect choice for landlords, renters or homeowners looking for a durable but convenient solution. It needs no fixings, as construction is simply a case of expanding the lattice frame, and placing a mattress on top. Convenience doesn't usually go hand-in-hand with sustainability – think about convenience food wrapped in one-use plastics and convenient makeup wipes that you throw away after use. However, the Room in a Box bed really does make it quick, easy and convenient to turn any space into a bedroom in under a minute. The product has been manufactured to be as low impact as possible. The glues, made from corn, wheat and potato starch, will satisfy those who avoid the use of animal products. It might not be something you think of when buying furniture, but vigilant vegans and vegetarians should be aware that some glues contain collagen obtained from animals. The bed is also not only made primarily from recycled materials, but the corrugated cardboard is 100% recyclable should you need to dispose of it. Either recycle the bed at your local tip, or even plant it up in the garden as a bio-degradable raised bed. And, don't forget about delivery. Being lightweight and compact, the bed maintains a small carbon-footprint on its way to your front door. Delivery is provided by DPD who have pledged to keep their CO2 emissions low. Design appeal has not been forfeited in the quest to create an eco-friendly product. The durable, corrugated cardboard bed comes in four finishes – classic cardboard, white, black and petrol. Being of a fairly minimalist design, the bed is great for an understated look. Buy it online for just £99.99 including delivery.